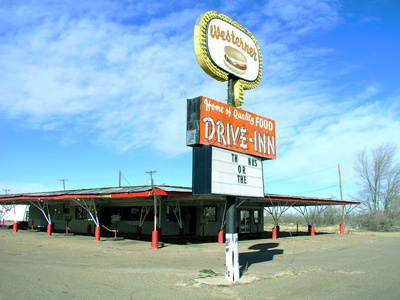 The best tacos I ever ate were at the local drive-inn in my home town called “The Westerner”. 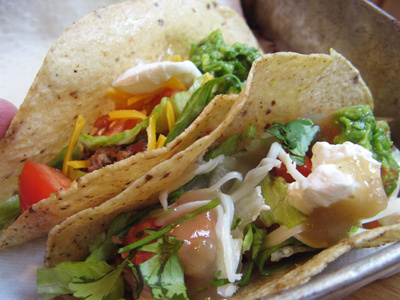 My sister and I loved these tacos and would make a “Westerner” run whenever we had a taco craving. 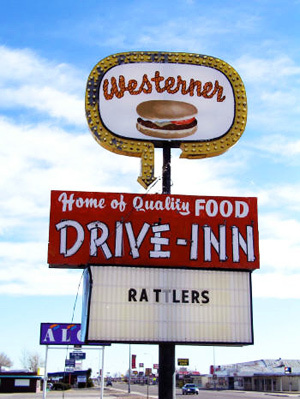 The Westerner is no longer there anymore but Kat and I still reminisce about those tacos to this day. The tacos I made tonight might be called leftover tacos, simply because I had a little leftover ground beef and a couple odd pieces of chicken in the freezer that I didn’t know what to do with. There wasn’t enough of either one to make a meal so I compromised and made 2 small skillets, one of chicken taco meat and the other ground beef. I raided the fridge for toppings, finding a little of this, a little of that and in the end we had a taco bar going to fill your own tacos. 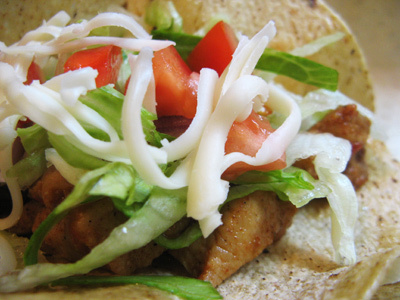 Starting with the chicken tacos. I had 2 boneless skinless chicken thighs (about 1/2 pound) and cut them into small bite size pieces. 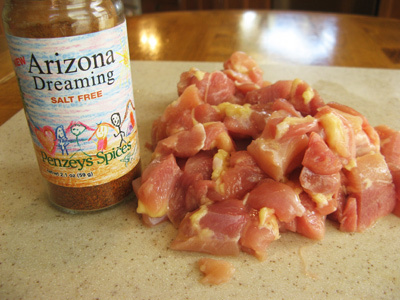 I seasoned the chicken with Arizona Dreaming, a Penzey’s spice blend. 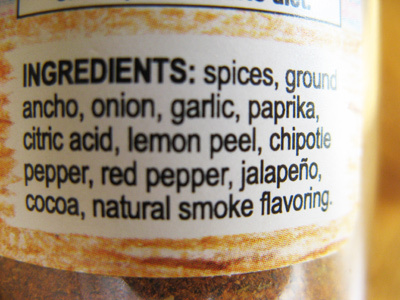 You can use taco seasoning too if you want, I sometimes do, but they contain so much salt and I’m trying to cut back. Here’s the list of ingredients for Arizona Dreaming. I thought it sounded good for tacos. 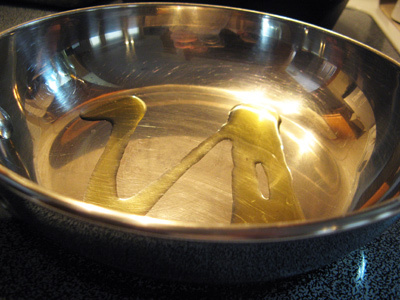 I heated a cast iron skillet and drizzled it with olive oil. 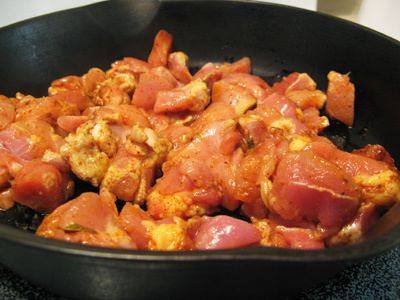 Season the chicken, as much as you want and add to the hot skillet. Let it sizzle for a bit and then stir it around to brown on all sides. Once the chicken has browned on all sides, I’m going to add 1/2 can Rotel. I’ll use the other half for the beef tacos. It looks like a lot of juice, but if you just keep simmering it over medium heat it will cook down. It simmered for 10 minutes and the chicken absorbed all the flavors. While the chicken was simmering, I had a non-stick pan going over medium high heat with 1/2 pound ground beef browning. 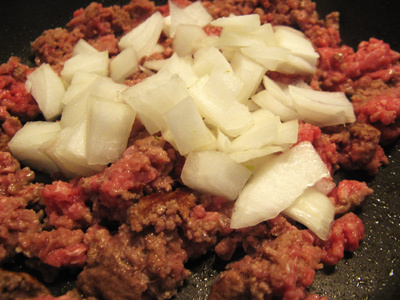 I added 1/2 cup diced onion and let them saute along with the meat. Sprinkle Arizona Dreaming seasoning over meat, about 1/2 teaspoon. In minutes the ground beef is cooked through and the onions are translucent. Add the remaining 1/2 can of Rotel. Give it a few minutes to simmer and let the juices absorb into the meat. Taco meat is simmering and almost ready. Time to get the tortillas ready. 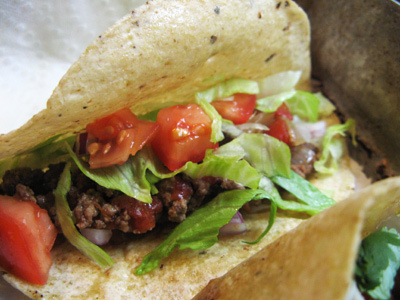 I love thin corn tortillas for tacos. 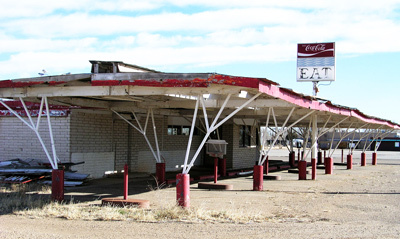 They are hard to find, but they remind me of Westerner tacos. I’m in the minority at my house, everyone else likes flour tortillas, so I have them on hand too. 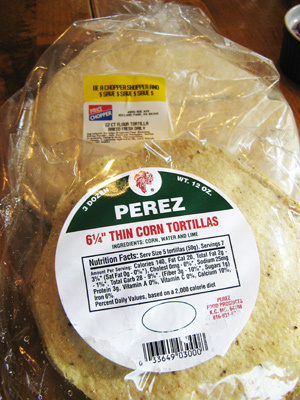 I’m going to soften my corn tortillas by quickly pan frying them on each side. Add a drizzle of olive oil to a small pan and heat it up. It’s a quick process, after 30 seconds flip it over and quickly cook the other side. Once it starts to sizzle, take it out. 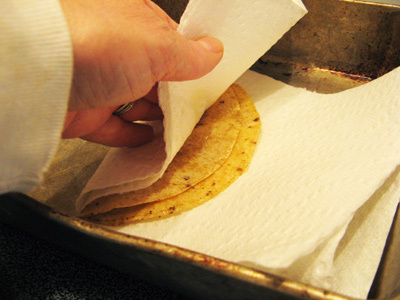 Another note, after the first tortilla is cooked, turn the heat down because the next tortillas will cook much quicker and you don’t want them to get too hard and crispy to fold. I like them soft so that you can shape them. Transfer to a paper towel and blot it dry. 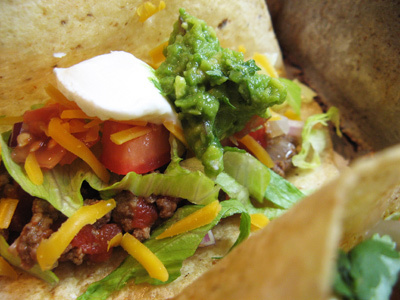 Fold into a taco shell shape with the paper towel. Earlier I chopped and diced and shredded and assembled some taco toppers. 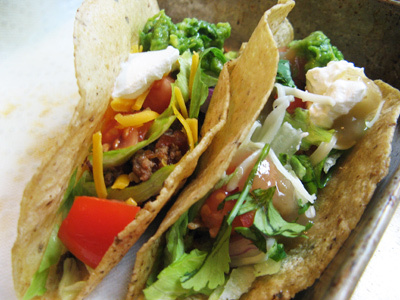 Anything goes, build your own taco. This Ortega red taco sauce reminds me of the sauce packets that came with our tacos at The Westerner. When you have the amount of tortillas cooked and folded, start filling them. Some chicken . . .
And some toppings . . .
And some more toppings . 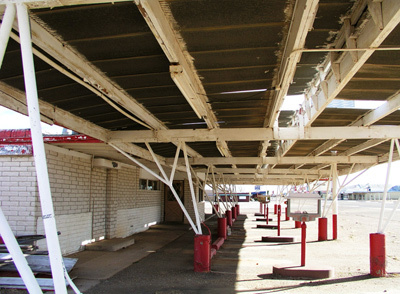 . .
Time for a beef taco. Here they are side by side, one with red sauce, one with green. One with Monterey Jack, one with Cheddar. Which one do you want? I had one of each! 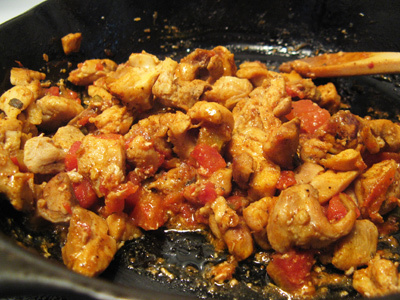 Brown chicken in a skillet drizzled with olive oil over medium high heat. Sprinkle taco seasoning over meat and stir. 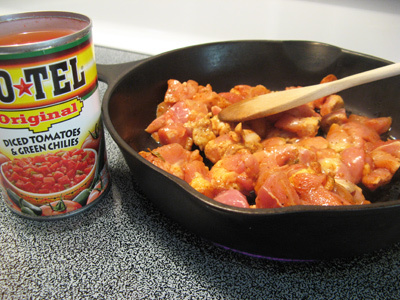 When chicken has browned, add 1/2 can Rotel. 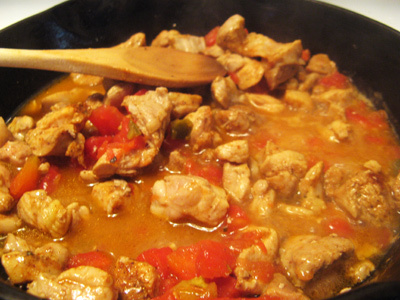 Turn the heat to medium and simmer for 10 minutes or just until the juices evaporate and absorb into chicken. 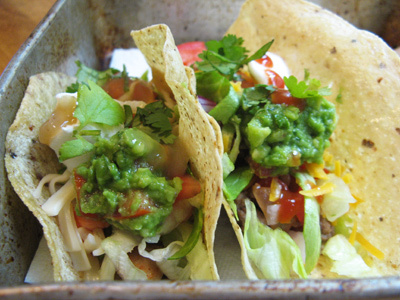 In a small pan drizzle olive oil and add corn tortillas, one at a time frying a few seconds on each side to soften. 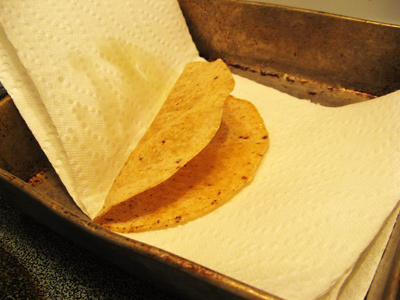 Using a paper towel, blot the oil off of the tortilla while folding it into a taco shell shape. 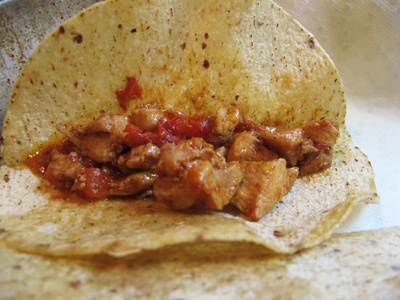 Set aside in a warm place until all tortillas are cooked. 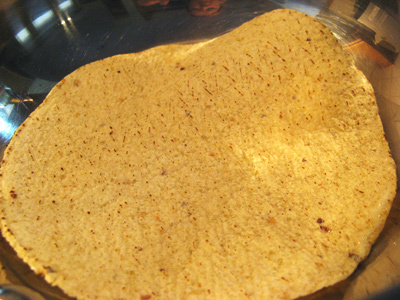 Note* If using flour tortillas, microwave 20 seconds. 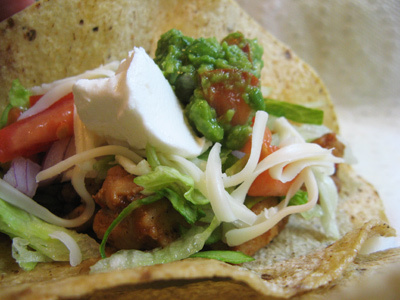 Fill taco shells with chicken taco meat, add toppings and taco sauce. Makes 4 – 5 tacos. 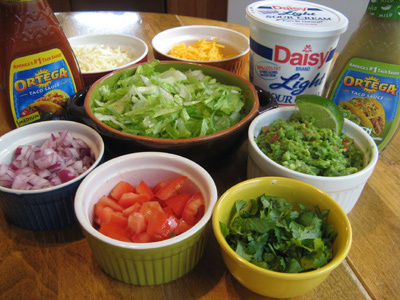 Note** Toppings included Monterey Jack Cheese, Cheddar Cheese, Shredded Lettuce, Diced Tomato, Diced Red Onion, cilantro, sour cream, guacamole, Ortega Red Taco Sauce, Ortega Green Taco Sauce. 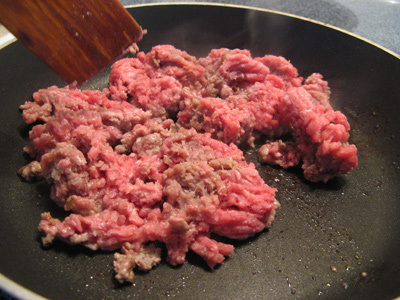 Brown ground beef in a skillet drizzled with olive oil over medium high heat. 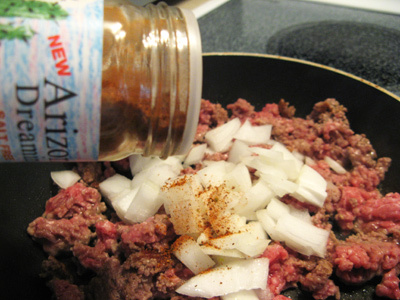 Once meat begins to brown add diced onion and taco seasoning. Continue stirring meat and onion until browned and cooked through. Add 1/2 can Rotel, turn heat down to medium and simmer until the juices evaporate and absorb into meat. 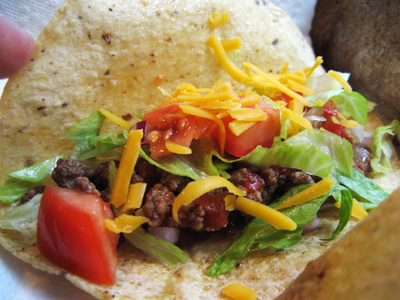 Fill taco shells with beef taco meat, add toppings and taco sauce. 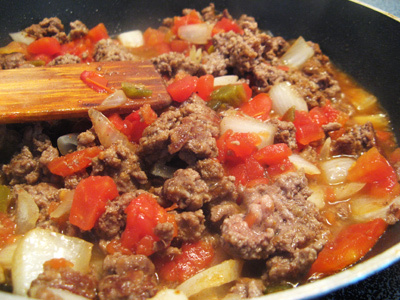 Note *** If ground beef cooks out too much fat, drain the meat using a strainer before adding the Rotel. 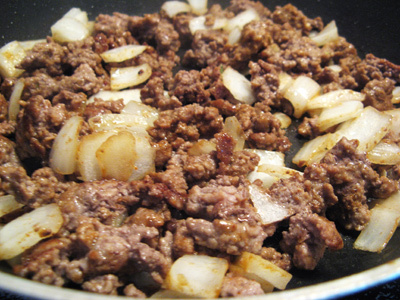 I usually use lean ground beef so that there is very little fat that cooks out. I came across some photos on the web. 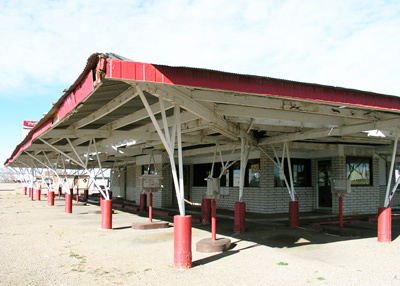 Here’s the Westerner just after it closed but before it was torn down. 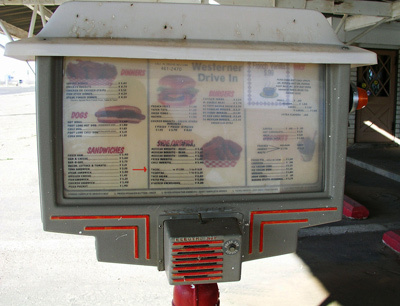 Click on the menu to enlarge the photo and you can see the tacos are $1.20 or 3 for $3.15.